NETWORK FINALS: THE BIG BANG THEORY and YOUNG SHELDON gamed 0.1 in final numbers, while FOR THE PEOPLE lost the same. CABLE HIGHLIGHTS: TNT’s NBA doubleheader led Thursday cable at 0.56/0.51. 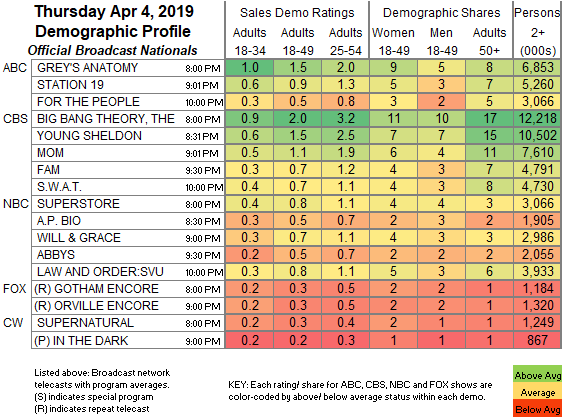 MTV’s EX ON THE BEACH rose 0.06 to 0.35, and the season finale of GAME OF CLONES was at 0.17/0.13, compared to last week’s 0.11. On VH1, RUPAUL’S DRAG RACE gained 0.04 to 0.31, and UNTUCKED was up 0.03 to 0.22. On HGTV, HOUSE HUNTERS INTL climbed 0.06 to 0.29, HOUSE HUNTERS grew by 0.05 to 0.26, and FLIP OR FLOP was down a tick to 0.20. Food Network’s BEAT BOBBY FLAY was steady at 0.28. Fox News’s TUCKER CARLSON TONIGHT led cable news at 0.28/0.46/2.8M, with MSNBC’s RACHEL MADDOW SHOW at 0.25/0.39/2.8M, and CNN’s ANDERSON COOPER 360 at 0.13/0.18/900K. On ID, KILLING TIME ticked down to 0.27, and DEAD OF NIGHT was up 0.03 to 0.26. On History, SWAMP PEOPLE lost 0.04 to 0.26, and the premiere of THE AMERICAN FARM was at 0.16. ESPN’s COLLEGE SLAM-DUNK CHAMPIONSHIP special was at 0.23. 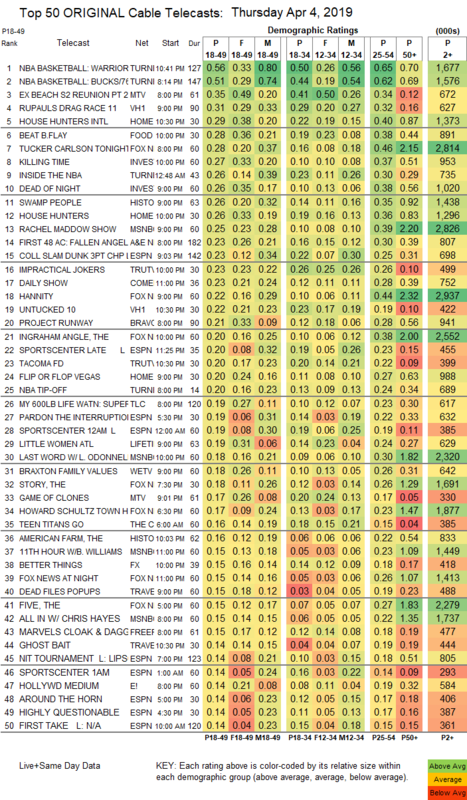 On Tru, IMPRACTICAL JOKERS dropped 0.07 to 0.23, and TACOMA FD was down 0.02 to 0.20. Comedy Central’s THE DAILY SHOW, sparked by a Bernie Sanders interview, was #17 at 0.23. Bravo’s PROJECT RUNWAY ticked down to 0.21. On Lifetime, LITTLE WOMEN ATLANTA shed 0.04 to 0.19, and LITTLE WOMEN LA returned at 0.13. On We, BRAXTON FAMILY VALUES jumped 0.11 to 0.18, and HUSTLE & SOUL was at 0.11. FX’s BETTER THINGS gained 0.02 to 0.15. Freeform’s CLOAK & DAGGER had a 2-part season premiere at 0.15/0.11, lower than last year’s series premiere 0.32/0.25, but in keeping with the 0.15 season finale. E!’s HOLLYWOOD MEDIUM shrank by 0.03 to 0.14. Paramount’s WIFE SWAP premiered at 0.13. Showtime’s DESUS & MERO was at 0.01/30K.